Phantoms began after I was given a box of projector slides. These slides covered the entirety of art history, ranging in subject matter from early cave paintings to postmodern video stills. When first rummaging through this box, I became aware that condensed inside was a sampling of all art historical objects compressed into one place. The idea that I could collapse all of art history into a box haunted me and became the impetus for Phantoms. I was inspired to collapse the time and space surrounding these slides into one image. This led me to begin overlaying slides and then scanning them together. The result was to create composites that read by means of opacity. Light values could overlay and combine with clarity, while darker values created black, flat planes that muted any other value below. Ultimately, this idea of opacity influenced the way I wanted to present these images. I chose to use a material that reinvested them with a sense of translucence, and reinforced the visible effect that these images are layered. I chose Mylar because it was able to replicate this effect; it is itself translucent, and thus not only makes the image appear so, but it is also double-sided, which echoes the overlaid slides that I used as sources. From this point onward, I began to think of these images as a dialogue between the degradation of the source image and the creation of a new one. The first step is the actual art historical object. Next, that object is photographed and the resulting image is turned into a slide. Finally, these slides are overlaid together and scanned in order to form a new image. Thus, this process reflects a transition from physical source object to analog slide to digital composite and then back to an object resembling that slide; the effect is to leave the viewer at a distance from the source by only presenting a digitally created phantom. It is also important that these composites are derived from archetypal source images. 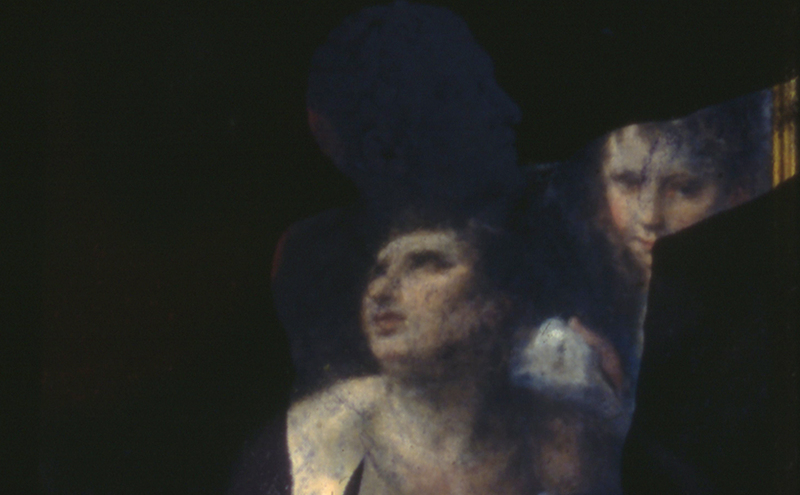 In choosing slides depicting Greek Sculpture, Renaissance Paintings, and Master’s Portraiture, the distancing of the scanning process does not fully abstract the composite. Instead, the composite hovers between being something totally alien and being something recognizable – as being both opaque and transparent. Additionally, by overlaying source images together, new allegorical references are formed for each individual component. In this way, the composites function as collages do, but rather than being a physical layering of materials, it is a compression of overlaid images reduced to gradations of hue and value. In a larger sense, these works reflect a systemic loss of context for real world objects when those objects are confronted with digital processes. Through the use of digital media, one can literally merge painting onto sculpture and vice-versa; objects that were separated by both thousands of years and miles, can now be collapsed down into one composite image. Thus, for me, this work represents an opportunity to explore how long such objects can maintain their aura, and when do new associations begin to override the old ones? Jon Rowe is an artist currently living in Winston-Salem, North Carolina. Rowe studies at Wake Forest University, where he is pursuing a BA in Studio Art. Rowe has exhibited work in several group shows, as well as two solo shows. Additionally, Rowe has helped to purchase works, from artists such as Hiroshi Sugimoto and Thomas Struth, for the Wake Forest Student Union Collection of Contemporary Art; after which, he was able to speak about the experience, of buying contemporary art as a student, at SECAC 2013. For Rowe, helping to purchase these works has reinforced his interest in digital media, as well as his broader interest in vision, and using art as a means to investigate it.